Decorating a cake with roses made from frosting may not sound so easy, but trust us, they are! In fact, they just might be one of the more forgiving ways to decorate a cake. Start by baking your favorite flavor of cake. (We went with a simple yellow cake.) While the cake is in the oven, you can make the frosting. Start with a cup of shortening and vanilla extract. Cream the two together for a couple minutes until fluffy. Now add powdered sugar, a little at a time. Once half of the sugar has been incorporated, slowly pour in the milk. Continue to add the rest of the powdered sugar a little at a time. 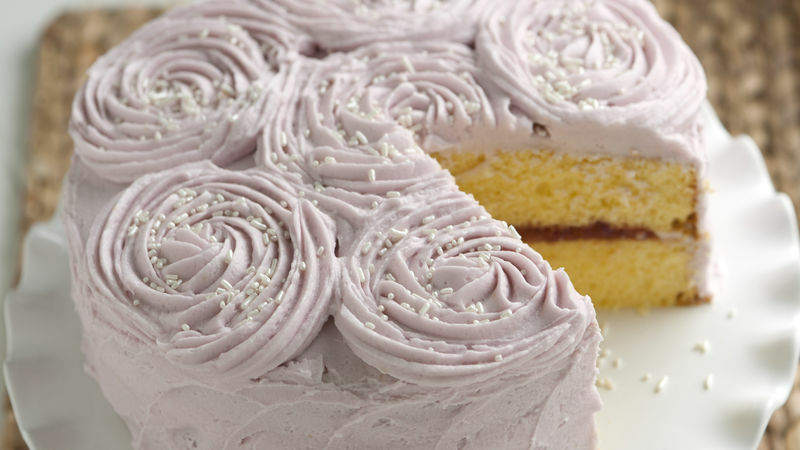 To color the icing, use food coloring paste. We wanted a light pink hue, so we mixed red and a very small amount of blue. First add the paste to a spoon and then to the frosting. That way, you won't add too much by accident. Once the cake has cooled, you can begin to decorate it. Place one of the cakes rounded side down on a plate and pipe a thin ring of frosting around the edge. Fill the middle with strawberry jam. Place the second cake rounded side down over the first layer. Frost the whole cake with a thin layer of frosting. Then go back and fill in any holes. Now, you can decorate the top of the cake with roses. Using a frosting-filled piping bag fitted with a large star tip, start in the middle of the cake and slowly swirl the tip around the center point. Continue making roses around the top of the cake until it is covered. Sprinkle the tops of each rose with some ivory sprinkles.